Recommendations are made to assist the implementation of the KM standard, following its expected publication in January 2019. 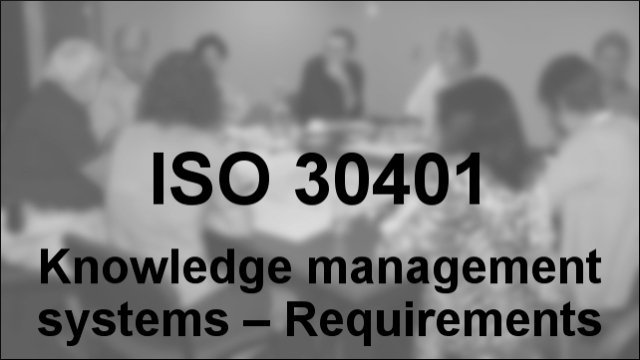 This article is part of a series of articles on the new international knowledge management (KM) standard, ISO 30401 Knowledge management systems – Requirements. The draft of the new international knowledge management (KM) standard, ISO 30401 Knowledge management systems – Requirements, was released for public comment on Thursday 23 November 2017. The comment period has closed, and a comment resolution process is scheduled for later this year. The standard is subsequently expected to be approved and then published in January 2019. 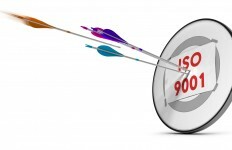 The draft of ISO 30401 has received a mixed response. It has been welcomed by many, particularly those directly involved its development, but criticised by others, both for the closed nature of the development process and for the contents of the draft. We’ve previously published a number of articles discussing and addressing these criticisms. In December last year, I wrote an article in which I endorsed the criticisms of the closed development process, expressing the view that it’s actually rather oxymoronic that the development process for an important knowledge management standard has not involved the widest diversity of relevant knowledge. In that article I also called for criticism to focus on the design and conduct of the development process, rather than on the people involved, and expressed the hope that if the International Organization for Standardization (ISO) technical committee responsible for ISO 30401 could move to facilitate open discussion on the draft, then it would still be possible for the KM community to unite in support of it. In a subsequent article in early January, Stephen Bounds identified 11 recommendations which he contends would substantially improve the contents of the draft. Then, with there being no indication that the technical committee responsible for ISO 30401 is opening up the development process, I wrote a further article last month offering lessons from another sector in regard to open, inclusive, participatory processes. In this new article, I move forward in time to the future implementation of ISO 30401, following its publication early next year, and explore some potential risks and opportunities. Attempting to predict the future is itself risky, but as I’ve previously discussed, active horizon scanning can help people and organisations to anticipate and respond to what could otherwise be “Black Swan” events. First, let’s look at what will happen when ISO 30401 is published. ISO 30401 is a management systems standard (MSS), and it uses the same high level structure as a number of other ISO MSS including the well-known ISO 9001:2015 Quality management systems – Requirements and ISO 14001:2015 Environmental management systems – Requirements with guidance for use. This structure uses common text, terms, and definitions, which ISO advises can help organisations that operate a single or integrated management system to meet the requirements of two or more management system standards simultaneously. To claim conformance with a standard, an organization needs evidence that it is meeting the requirements. Such evidence gathering is generally done by undertaking an audit. There are three types of audits: first-party, second-party, and third-party. First-party audits are internal audits. Second and third party audits are external audits. A third party audit can result in certification. Accreditation is not compulsory, and non-accreditation does not necessarily mean it is not reputable, but it does provide independent confirmation of competence. To find an accredited certification body, contact the national accreditation body in your country or visit the International Accreditation Forum. The International Accreditation Forum (IAF) is “the world association of Conformity Assessment Accreditation Bodies and other bodies interested in conformity assessment in the fields of management systems, products, services, personnel and other similar programmes of conformity assessment.” For example, the IAF national conformity body for the United Kingdom is the United Kingdom Accreditation Service (UKAS), which reports having accredited over 2,800 certification parties. So, in short, after ISO 30401 has been published, organizations across the world will be able to use it for guidance, and will also be able to claim conformance with it through audit or certification. The audits and certification can be carried out by parties that may or may not be accredited, and there are a large number of accredited certification bodies. A number of potential implementation risks can be identified from comments and concerns expressed about ISO 30401 and KM standards generally, and also from issues associated with other ISO standards. There are three areas where the mills operate: certification of persons, through bogus unaccredited professional credentials; certification of organizations through unaccredited management system certs; and unaccredited certification of products, the most nefarious and dangerous of them all … Without accreditation, the only reliance is on the law, and cert mills know how to work up to the very limits of lawbreaking, without crossing that line, making them unanswerable to anyone. Firms with symbolic profiles try to gain legitimacy through the adoption of ISO 14001 but they do not necessarily achieve improvements in environmental performance. Consequently, this symbolic adoption of ISO 14001 results in corporate behavior that contributes to the degradation of confidence in the standard. Contrary to the notion of Standards, today’s stunning productivity growth, knowledge economy and disruptive innovation depends entirely on originality, network combination, conceptual blending, cognitive diversity, knowledge variation and disequilibrium. Codification inhibits understanding and attenuates prosperous knowledge creation. These facts alone makes standards for knowledge or KM utterly preposterous. However, a standard that doesn’t specify exactly what people should do potentially increases the risk of low-quality certification and the risk that organizations implement the standard symbolically rather than meaningfully. Amplifying this risk, a large number of parties that are not companies specializing in KM are likely to seek accreditation as certification bodies for ISO 30401. Accredited certification bodies typically offer certification across a number of management systems standards, and they will potentially want to add ISO 30401 to their list. As can be seen from discussions in some online KM forums, there are deep divisions within the KM community, and strong criticism has already been leveled at ISO 30401 and its development process. As I’ve previously discussed, a KM standard development that fails to adequately involve all relevant stakeholders can lead to people completely abandoning the process and never wanting to return. …on October 30th, 2011 the Standards Institution of Israel published the first Knowledge Management standard (ISO Israeli Standard 25006) … As expected from a company which specializes in Knowledge Management, we didn’t hesitate and decided to set an example for our clients, and check and assess our company’s Knowledge Management system. As discussed above, ISO 30401 has the same high level structure as ISO 9001:2015, which can help organisations that operate a single or integrated management system to meet the requirements of two or more management system standards simultaneously. And, the second and third most popular articles in RealKM Magazine both deal with ISO 9001:2015 Clause 7.1.6, suggesting a strong need for guidance on meeting the requirements of this clause. ISO 30401 can meet this need, and while adopting ISO 30401 would require an additional commitment of resources, this could be minimised by integrating ISO 9001:2015 and ISO 30401 into the same management system. Recommendation 1: In addition to actively encouraging their clients to seek certification against ISO 30401, companies that specialize in knowledge management should set an example for their clients by first conducting audits of their own knowledge management systems using ISO 30401. Recommendation 2: Uptake of ISO 30401 can be encouraged through linking ISO 30401 to ISO 9001:2015 Clause 7.1.6 Organisational knowledge. Complexity thinkers must acquiesce that the management paradigm that produces documented standards, frameworks and guides is still dominant in organisations and consider this reality. Yet the existence of a KM Standard does not prescribe the way in which it will be used. KM Standards and frameworks can be considered as part of the rich complex environments in which knowledge work takes place. Emergence will see knowledge workers responding to their environment and creatively using whatever objects are available to the benefit of their practice. The paper explored whether the (now withdrawn) Australian KM standard Knowledge management – a guide resulted in any benefits to large Australian government agencies. It found that the standard was held in reasonable regard, and had been useful. Recommendation 3: Opponents of KM standards should accept that standards and frameworks are part of the rich complex environments in which knowledge work takes place. The risks of low-quality certification, organizations implementing the standard symbolically rather than meaningfully, and the standard not being specific enough can be addressed through the provision of advice and guidance in regard to ISO 30401 and its implementation. This can be achieved through the development and publication of a range of guidelines and other standards, and the development and delivery of training. The guidelines, standards, and training activities should be coordinated by an organisation that has the support and participation of the widest range of people in the global KM community. This organisation would also be able to address the risk that the standard exacerbates divisions in the KM community. [PMI] global standards are developed through a voluntary consensus process that brings together volunteers and subject matter experts with an interest in the standards’ topics. The process relies on public feedback, and there’s multiple ways for you to get involved in the activities. Sharing with no boundary. The network promotes responsible sharing facilitated via both electronic and face-to-face channels, breaking down geographical and time barriers. Learning from everybody. The network promotes individual as well as collective learning among members in a respectful and cordial manner. Collaborating with expert bodies. The network promotes collaboration among members, leveraging on individual as well as expert bodies embodied in the network. It is also the vision to continuously identify and grow the expert pool to serve its members and community. Arthur Shelley, an Australian knowledge manager and collaboration advocate, has recently started to facilitate discussions aimed at expediting the development of the KM Global Network. His efforts should be supported. Recommendation 4: The development of the Knowledge Management Global Network (KMGN) should be expedited, including adding new network members for other regions of the world. 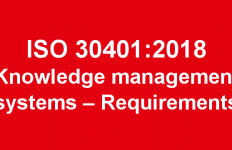 Recommendation 5: The Knowledge Management Global Network (KMGN) should coordinate the provision of advice and guidance in regard to ISO 30401 and its implementation, through the development and publication of a range of guidelines and other standards and the development and delivery of training. Recommendation 6: The Knowledge Management Global Network (KMGN) and its member organisations should be established as inclusive bodies that conduct, facilitate, and advocate open participatory processes. Bruce Boyes (www.bruceboyes.info) is editor and lead writer of the award-winning RealKM Magazine (www.realkm.com) and currently also teaches Academic English as part of the University of NSW (UNSW) Foundation Studies program in China. He has expertise and experience in a wide range of areas including knowledge management (KM), environmental management, program and project management, writing and editing, stakeholder engagement, communications, and research. Bruce holds a Master of Environmental Management with Distinction and a Certificate of Technology (Electronics). With a demonstrated ability to identify and implement innovative solutions to social and ecological complexity, Bruce’s many career highlights include: (1) establishing RealKM Magazine as an award-winning resource for knowledge managers, (2) using agile approaches to oversee the implementation of an award-winning $77.4 million river recovery program in western Sydney on time and under budget, (3) leading a knowledge strategy process for Australia’s 56 natural resource management (NRM) regional organisations, (4) pioneering collaborative learning and governance approaches to empower communities to sustainably manage landscapes and catchments, and (5) initiating and teaching two new knowledge management subjects at Shanxi University in China.